This comprehensive tour captures China´s extraordinary history and untouched beauty as it traverses across the country´s diverse regions. 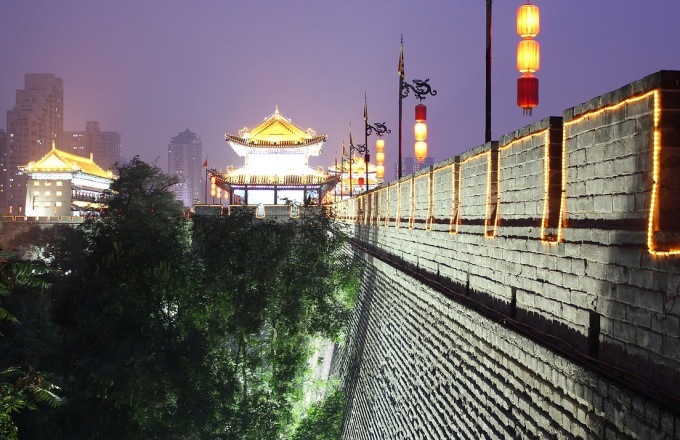 From China´s capital of Beijing, to ancient Xian and marvel at its ancient wonders. Witness the unrivaled poetic landscapes of Guilin´s Li River and dive into metropolitan Shanghai and "Pearl of the Orient", the modern city of Hong Kong, where the unique skylines bear witness to China´s dynamic past and present. Excitement fills the air as we board the international flight to Beijing. As the plane crosses the International Date Line we spend the night aboard. Touch down in the capital city of China and greet our local guide in the arrivals hall. Transfer to our luxury hotel where we can unwind and relax for our full day of sightseeing tomorrow. Spend the day free or take the tour to visit the Great Wall, which is one of the man-built architectures that can be seen from the from the low orbit of the earth. The Great Wall is a massive defensive structure built to keep intruders from invading the mainland. It stretches an impossible 4000 miles across China's north, covering nine provinces. An enormous undertaking that originally began under Qin Shi Huang (first emperor of China) in 200 B.C., the Great Wall was not completed until the Ming Dynasty in 1640. This morning you have plenty of time to walk along its ancient path and experience part of China's fascinating history. Today we continue our journey by flying to Xian, the capital of Shannxi Province, one of the oldest cities in China. Xian is one of the Four Great Ancient Capitals of China with more than 3100 years of history. The city was known as "Chang'an" before Ming Dynasty. Xian is the eastern teminus of the Silk Road and home to the Terra Cotta Warriors. Upon arrival in Xian, we will drive into town, passing through its massive City Wall, the best preserved defensive wall structure on earth and have a picture stop at Drum Tower and Bell Tower. In the evening, don't miss the chance to taste the local famous dumpling banquet. Rest at the hotel or take the opportunity to visit one of the most significant archaeological discoveries of the 20th century, the Terra Cotta Warriors. One of the four ancient capitals of the world, Xian has been lauded for its abundance of historical relics, including its most famous, the Terra Cotta Warriors. Serendipitously discovered by a farmer in 1974, the realistic army of clay soldiers, horses and carriages has won the city international acclaim. Unearthed from the mausoleum of China’s first emperor, the life size army stand proudly in battle formation. After surveying the troops, we venture back to the city and visit the Big Wild Goose Pagoda, one of the best-preserved Buddhist pagodas in China. Tonight, take the opportunity to enjoy the cultural musings of the Tang Dynasty Show, a song and dance performance which reflects the rich cultural history and prosperity of the Tang Dynasty (618-907). Depart for Guilin, a city renowned for its picturesque landscapes and dramatic natural beauty. Nestled on the banks of Li River, it is a charming escape from the hustle and bustle of nearby city life. As the old Chinese saying goes, "The scenery of Guilin is unrivalled under heaven.” Karst limestone formations imbue Guilin's landscape with a mystical, dreamlike quality. Today, we will explore Reed Flute Cave, where fantastic stalactite and stalagmite formations create a hauntingly beautiful atmosphere. After lunch, our tour continues to the Longji Ancient Zhuang Village and Longji Rice Terraces. These majestic terraced fields are built along the slope winding form the riverside up to the mountain top, the highest point being 880 m in elevation. The Longji rice terraces are simply breathtaking during every season – from the lush green paddies in the summer to the golden yellow sheen in autumn, the Longji Rice terraces are a sight you won't want to miss. This morning, we visit the Shanghai Museum and view the exhibits of ancient Chinese art. Designed by a local Shanghai Architect, the current building was completed in 1993 and resembles the shape of a bronze cooking vessel. Afterwards, we visit City God Temple Bazaar, the Nanjing Bund and the Bund. Spend the afternoon relax at the hotel or take the optional tour to Lujiazui Finance and Trade Development Zone and a ride on Huang Pu River Cruise. In the evening, do not miss the opportunity to experience the exciting Chinese Acrobatics Show (with dinner). Transfer to the airport and board a short flight to the dynamic island of Hong Kong. Upon arrival, check into our selected hotel and spend the rest of the day free at leisure. Enjoy your leisure time in Hong Kong.we will take you to visit the Victoria Peak, Stanley Market, Repulse Bay and Aberdeen Floating community.Victoria Peak, one of Hong Kong’s most famous scenic spots, offers breathtaking views of Hong Kong’s skyline, Kowloon, and Victoria Harbour. The Peak, as locals call it, is located on a mountaintop and is reachable by the Peak Tram. Pulled by steel cables, the tram climbs 1,200 feet (about373 meters) up the side of the mountain.Stanley also has beautiful beaches that are popular with windsurfers, as well as a wide variety of trendy bars and restaurants to enjoy after a long day of sightseeing. Our voyage through China and Hong Kong comes to an end as we board our international flight back to the US. Prices listed are based on two people in one room and departure from Los Angeles (LAX) on the transpacific portion. Please inquire for other airports. For New York (JFK), please add additional $150 to tour fares.